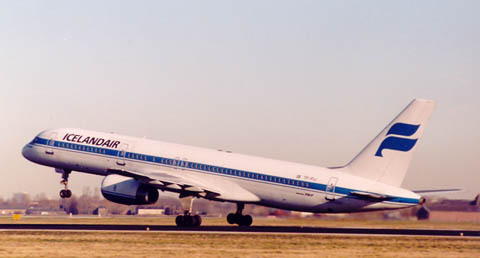 Iceair 757-208 TF-FIJ (cn25085/368) is seen here going airborne at Amsterdam Int'l sometime in May 1997. In 1948 US President Harry S Truman signed the Civil Aeronautics Board document permitting a new airline from a small country midway between North America and Europe to fly to the United States. It was then known as Loftleidir. Over more than 50 years later it is now the longest lasting private sector airline on the North Atlantic. On August 26, 1948 - three months after Truman authorized service - Loftleidir's brand new Skymaster aircraft with 46 passengers landed at Idlewild Airport (now John F. Kennedy International Airport). In 1952, the airline began regularly scheduled service between New York and Europe via Iceland - service that remains to the present time. Early flights crossed the Atlantic in used Douglas DC-4 Skymasters, allowing the airline to charge the lowest fares on these routes. By 1958, round-trip fares were based on seasonal schedules, with low-season New York to London fares at $392, Copenhagen $409 and Oslo $395. By 2000 these prices had not altered that much, showing the influence of competition and efficiency. During the '60s and '70s, Icelandair was called Icelandic and became the favorite airline for college students traveling abroad. The fares suited their budgets and Luxembourg suited their destination needs, as backpacking from "the heart of Europe" became extremely popular. Icelandic was dubbed "The Hippie Airline." By the early 1990s, Icelandair had developed an efficient hub and spoke system, around a modern, passenger-friendly airport in Keflavik, Iceland. Icelandair now flies from not only New York (JFK) but also Boston, Minneapolis/St. Paul, Baltimore/Washington (BWI) and Orlando (seasonal) via Reykjavik to Amsterdam, Copenhagen, Frankfurt, Glasgow, London, Oslo, Paris and Stockholm. By 2001 the fleet consisted of 3 Boeing 737s and 10 Boeing 757-200s. Boeing 737-408 TF-FID (cn25063/2032) is showing its attractive new livery. Over 1999 a profit was made of Usd 20.8 million and a little gold may very well feature in the decoration of the aircraft... No doubt inspired by the 50 year jubilee in 1998. By 1999 the new colorscheme appeared and has been progressively applied to Icelandair's aircraft.